Although the basic principles of archery are always the same there are many types of archery events. A few of the most common ones are explained here. Target Archery is the sort of shooting that you see at the Olympics and involves shooting a number of arrows at a target which is set at a fixed distance. The distances involved vary according to the capabilities of the archer and can range from 10yds up to 100yds. There are many different types target faces, and the number of arrows shot in a competition can range from 3 dozen up to 15 dozen. PLEASE NOTE – It is illegal in this country to undertake any sort of hunting or to shoot at any animal with a bow. 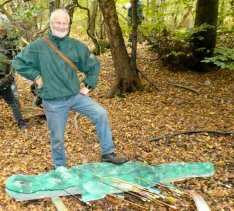 These include medieval, shooting at 3 dimensional animal targets, balloon shooting and many more! Clout shooting involves shooting up in the air so the arrow falls on a target that is marked out on the ground. A flag marks the centre of the target and the scoring zones are measured out using a rope attached to the flag. For more specialist longbow archers there are also several traditional styles of shooting that replicate medieval shooting events.